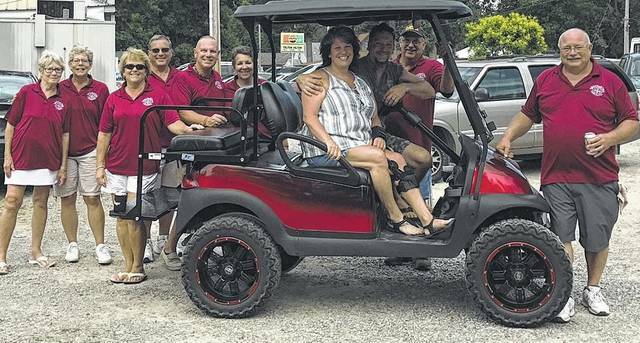 Teresa and Ralph Beherns of Lakeview won the drawing for a street-ready golf cart. The 18th annual Turkeyfoot Benefit Crew’s parade and auction had something for everyone. On Saturday, June 17, parade watchers were treated to the Shriners’ clowns and mini-Indy cars, as well as decorated golf carts and vintage cars. Immediately afterward, nearly 100 items donated by local residents and businesses were auctioned, earning over $14,000. The highlight of the day was the drawing for a street-ready golf cart. Sales of raffle tickets resulted in a profit of over $8,000 for the organization. The winner of the drawing was Teresa & Ralph Beherns of Lakeview. This volunteer neighborhood organization was founded in 2000 and, to date, has donated more than $575,000 to Caring Hearts supporting the efforts of Universal Home Health & Hospice Care in Bellefontaine, Tri-County Hospice in Wapakoneta, The Wilson Memorial Foundation in Sidney, as well as the Shriners. Their next fund raiser will be a golf scramble at Prairie View Golf Course on Saturday, August 26th. Those interested in golfing may contact the course to sign up. Hole sponsorships and door prize donations may be made by calling 937-760-5253.